Hey whatever you’re doing right now probably isn’t nearly as cool as this, the first glimpse of the cast of The Lion King hanging out. So drop what you’re doing and look at it real quick. And no, there’s no Beyoncé, so you can stop screaming. But look: there’s a Jon Favreau, a Seth Rogen, a Billy Eichner, and a Donald Glover, which gives you Lion King bingo anyway. 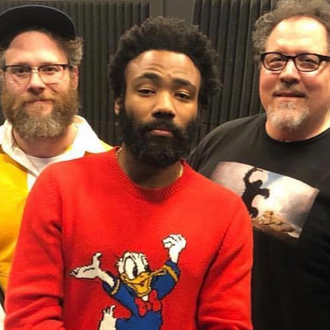 Glover, who is voicing Simba, is even rocking a Donald Duck sweater, because all the coolest kids are Disney kids, okay? The photo was shared on Favreau’s Twitter account Wednesday evening. It may even actually be a peek at the recording of “Hakuna Matata,” since Rogen and Eichner are voicing Pumbaa and Timon respectively. But look, that’s just a theory. A very, very, very exciting theory.